It’s probably just a coincidence, but some of the most seminal moments in the history of Creative Time—the New York City non-profit foundation for commissioning public art—have happened on the beach. In 1978, it was the empty sand dunes occupying a 92-acre stretch of land along the Hudson River that would eventually become Battery Park City. The place was miles from the nearest museum, and yet Creative Time recruited 13 artists to take up residence there, erecting large-scale installations and performing in the sand. Called “Art on the Beach,” the series brought the then-fledgling organization instant notoriety, and it went on that way every summer for the next decade: dance pieces by Bill T. Jones, a gigantic red megaphone that amplified frustrations about AIDS and human rights, an artist reimagining herself as a homeless woman inside a cage strung with dead fish. In 2005, it was Coney Island, over which the threat of real estate development had begun to loom. Working in collaboration with graffiti artist Steve Powers, Creative Time directed a team of young artists to flood the old seaside amusement park with hand-painted signs, murals, and concession stands, drawing huge crowds and reawakening them to the park’s cultural significance. Three years later it would help Powers return to speak out about state-sponsored torture with a funhouse diorama of a robotic mannequin being waterboarded. And this month, when the art world elite head south for Art Basel Miami Beach, the foundation’s name will be on the marquee for the very first time. 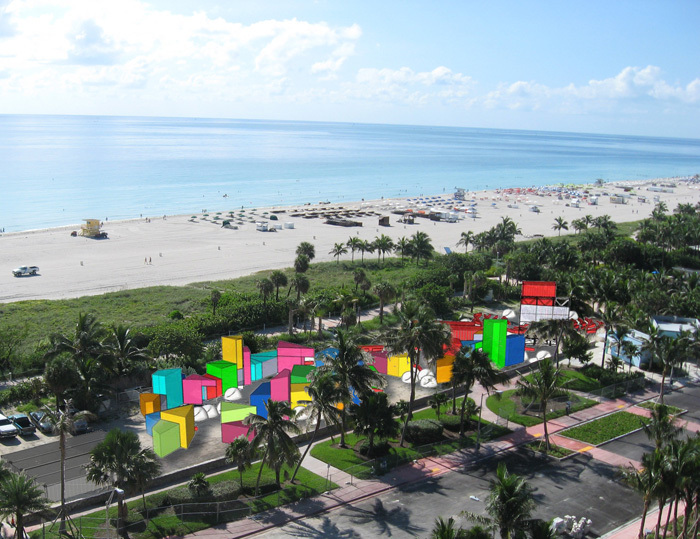 For the prestigious art fair’s eighth year, Basel’s organizers called on Creative Time to take the reins at its Oceanfront space, a prime stretch of South Beach where all the key performance art pieces, screenings, and talks will take place. Curator Meredith Johnson has commissioned Los Angeles artist Pae White to construct the event’s centerpiece: an open-air village made from scaffolding and colored scrims that will be backlit at night, offering a voyeuristic glimpse at booksellers, fortune tellers, and other Main Street types going about their business inside. Of course, any leitmotif one manages to pluck from Creative Time’s prolific 35-year history, be it beaches or social issues, usually just serves to underscore one fact: It’s by far the most diverse, forward-thinking arts organization in the city, which is how it has managed to stay remarkably relevant despite more than three decades of cultural influence. So whereas the Met has a massive building to fill and a long list of trustees to satisfy, Creative Time is completely nomadic and relies mostly on public funding and grants, so it can produce projects when, where, and how it chooses. It can spend a decade developing a relationship with an artist before actually commissioning a piece, or it can produce a work by an emerging talent on the fly. It can build physical installations like the faux village in Miami, or help sponsor the foundation of an alternative art school. And the lack of a physical gallery space means its projects can reach upwards and outwards without bound: One of the most visible initiatives of Anne Pasternak, who has served as executive director since 1994, was Tribute in Light, which projected two beams of light into the sky at the site of the World Trade Center six months after it fell. Earlier this year, chief curator Nato Thompson spent three weeks roaming the country in a mobile home with Turner Prize–winning artist Jeremy Deller, an exiled Iraqi citizen, and a veteran for “It Is What It Is: Conversations About Iraq,” which culminated in a public forum about the war at the New Museum. As a result, Creative Time’s boundary-pushing projects rarely resemble conventional art forms, which can make fundraising difficult. And yet during her tenure, Pasternak has taken the foundation’s annual budget from $350,000 to $2.5 million, in part because she’s done an amazing job showing people how Creative Time has forever altered the perception of what public art can be. To explain their approach to the genre, she and Thompson both like to invoke the image of sculptures being plopped down in the middle of public plazas: “I love them, but let other people do that,” Pasternak says. “We should be trailblazing, or there’s no reason for us to exist. I don’t believe in being redundant.” Creative Time’s sister organization, the Public Art Fund, traditionally took care of such static installations in New York, although recently even it has started to branch out into more experimental projects like Olafur Eliasson’s Waterfalls. The fundamental difference, Hoptman points out, is that Creative Time’s projects actually involve and engage the public, rather than just giving them something interesting to look at. “They’re especially good at engaging communities,” she says. In 2007, Thompson accompanied New York artist Paul Chan to post-Katrina New Orleans, where they worked with residents of the Lower Ninth Ward to stage an adaptation of “Waiting for Godot.” Chan spent a year living there, collaborating with citizens and community groups and trying to figure out the ethics of making art in a devastated city—how do you ensure you’re not promoting voyeurism, creating another disaster tour to transfix outsiders? Instead of making a documentary about the tragedy, and beyond simply flying actors in and out to stage a play, Creative Time also built a whole public program around the production that included free art seminars, theater workshops, and fundraising for rebuilding efforts. That said, the contemporary art world is also listening carefully. Since Pasternak’s arrival, Creative Time’s board of directors has bloomed with influencers like Beth Rudin Dewoody, Thelma Golden, and chairwoman Amanda Weil, plus artists including Shirin Neshat, Jim Hodges, and Vik Muniz. PaceWildenstein’s Marc and Andrea Glimcher are also big supporters. Photographer Marilyn Minter, whose glamorously perverse photographs Creative Time posted on a series of billboards in Times Square in 2006, says the organization has offered her more freedom than any other she’s worked with. “Anne and her staff are always willing to take risks, and they don’t privilege one art practice over another,” she says. “They run the gamut—who else does that? Museums and curators are unbelievably orthodox and academic.” Minter was recently in Los Angeles installing an exhibition: “Out here, whenever I talk to the non-profits, they say their model is Creative Time,” she says. The international art community is close-knit, especially at the top of the ladder. And everyone knows Creative Time. For the Miami Basel organizers, this year’s collaboration seemed long overdue. “When we decided that the new Oceanfront environment should be created by an artist, we immediately thought about partnering with them,” says co-director Annette Schönholzer. In a way, it was perfect timing: After three decades penetrating the strangest, most remote pockets of New York City, Pasternak says Creative Time has begun to look elsewhere for new challenges. Not only will there be more projects around the country, there’s an international collaboration in the works with the celeb-founded human rights organization Not on Our Watch, which is currently focusing on the crises in Darfur, Burma, and Zimbabwe. Thompson says he’s also begun a project with the filmmaker Jakob Boeskov in Lagos, Nigeria, where the film industry is nicknamed Nollywood. But Pasternak is quick to reassure that New York will always be Creative Time’s primary focus, not least because it’s always been the perfect testing ground for cutting-edge public art. “New Yorkers are super curious,” says Pasternak. “They’ll stop and pay attention to something that’s interesting, they’ll share their views about it, and they’ll go places they haven’t been before just because they want to know everything about their city.” And after 35 years, Creative Time is still showing them the most amazing things.